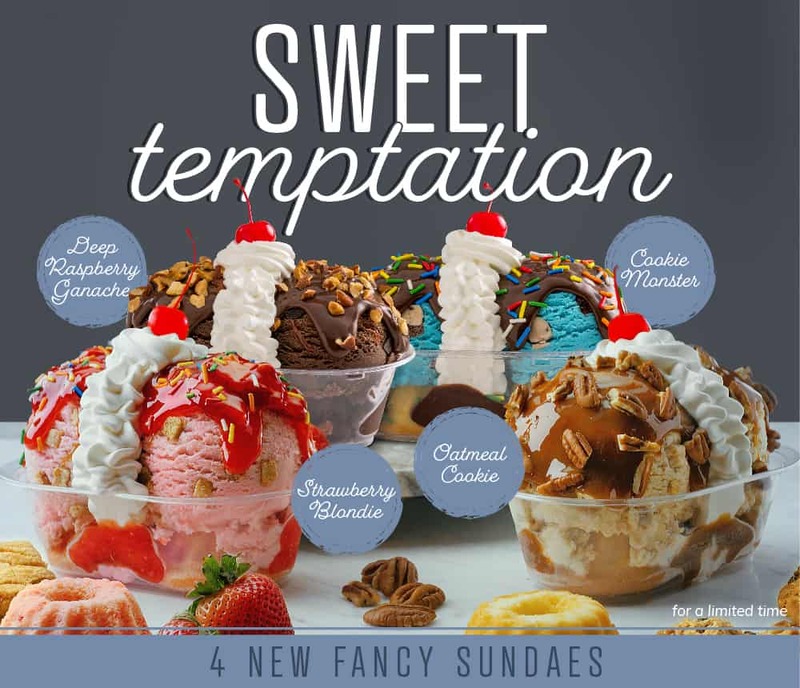 Braum’s new Sweet Temptations Sundaes are sure to satisfy even the most decadent sweet tooth! Try all four to find your new favorite! Our Cookie Monster Sundae starts with homemade Vanilla Bundt cakes baked fresh in Braum’s Bakery. We top them with Braum’s new Cookie Monster Ice Cream loaded with chocolate cookies and chocolate chip cookie dough! To make it even better, we layer on thick Hot Fudge, whipped cream, a cherry and sprinkles. It’s a cookie lovers dream! The Strawberry Blondie Sundae is made with delicious strawberry Bundt Cakes topped with our new Strawberry Blondie Ice Cream with blonde brownies and caramel ribbon. The strawberry goodness just keeps on coming with a generous helping of strawberry topping and sprinkles. It’s sure to take your love of strawberries to a whole new level. Love oatmeal cookies? Our Oatmeal Cookie Sundae is made with Vanilla Bundt cakes topped with Oatmeal Ice cream and creamy, hot caramel and pecans. What’s NOT to love? If you believe that there is no such thing as too much chocolate, then the Deep Raspberry Ganache Sundae is perfect for you! Chocolate Bundt cakes, thick hot fudge and our new Deep Raspberry Ganache ice cream make this sundae a chocolate paradise.